A bagged cereal from Quaker. A brown and white cow in an aviator's cap was featured on the bag. In 1999, a version of the cereal in Guatemala, El Salvador, Costa Rica, Nicaragua, Honduras, and Panama featured a Star Wars card adhered to the packaging. 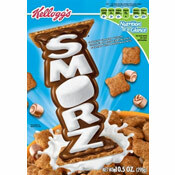 This cereal was previously known as Popeye Cocoa Blasts. 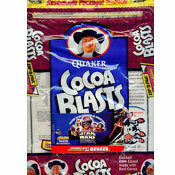 What do you think of Cocoa Blasts? I don't think they have this cereal anymore. :( It was supposed to have the most amount of caffeine in a breakfast cereal ever. Over 11 milligrams. Long live the age of sugar cereal. With caffeine. Yum! I haven't had it for year - and I don't know if they even make it anymore - but I have fond memories of it tasting great. Lots of chocolate flavor.